You know a sista's funds are tight during this recession. But there are some women out there who I want to support. Below are a list of fly sistas I'm spotlighting who are handling their business, literally. Since my wallet isn't going too far right now, shop in my place and support these sistas. Yay, Vanessa Williams has a new album! I've been waiting a few years for this one. The Ugly Betty star plays the heck out of the cunning and fake Wilhelmina Slater. But we know when it comes to singing, Williams is The Real Thing. The album debuted yesterday. Vanessa Williams has a beautiful voice. Between singing, acting and modeling Vanessa Williams is one of the most talented women in entertainment. She is long overdue for an Emmy and Grammy. Get with the program Hollywood. 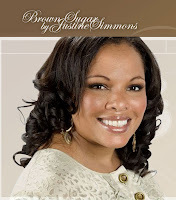 Justine Simmons, star of Run's House redefines "bling" with her Brown Sugar jewelry collection on Home Shopping Network. When I say "bling," I'm talking pirate's treasure chest, Ring Pop sized jewels. Simmons says some of the pieces are inspired by jewelry she saw her grandma wear. The line is a blend of vintage, estate-style jewelry with a sweet and hip finish th at makes it modern. 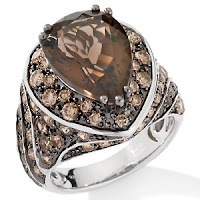 Simmons brings something new because the main attractions aren't just diamonds but garnette, sapphire, chocolate freshwater pearls, smokey quartz, and onyx. Simmons is not afraid to use color in her designs. I like diamonds, but colorful gems are my favorite. Some of the pieces are pricey, like in the $500 range. But I saw a few for $35 bucks. My only complaint is the two times I've seen her on HSN it's around 3am EST. I can tell the sista is tired. Come on HSN, give Justine a better time slot. A few weeks ago I met artist Stella Singleton-Jones at the Beverly Hills Affaire in the Gardens Art Show. This sista is amazing. She carves her sculptures out of rock. 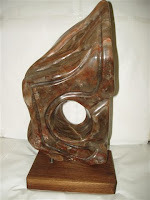 I repeat, she carves her sculptures out of rock. The process is intense but Singleton-Jones told me it gives her joy. The soul she puts into her work radiates from her pieces. Her inspiration--God. When I think of stone or rock, what comes to mind is stillness. But you can see the rhythm and movement in her pieces like Firecracker. Singleton-Jones is based in Los Angeles. The next Affaire in the Gardes will be in October. I'm a girly-girl. Went to charm school, played in my flower girl dress until I outgrew it, loved Miss Piggy, all of that. I went to a real charm school, not that mess on VH1. I'm also a serious tea drinker. 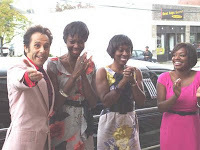 So when I saw these three ladies on the Style Network's Peter Perfect business makeover show I had to post them on Cocoa Fly. Sisters Monica, Sharee and Marolyn (they're related) own La Tea Dolly, a tea house for girls in Cleveland Heights,Ohio. I wish those were around when I was a kid. The Style Network hooked them up with personal makeovers and store renovations. I haven't been but from what I saw on TV the tea room looks nice. There's another sista handling her business on HSN. Tennis goddess Serena Williams is "serving up grand slam glam" in her HSN line. 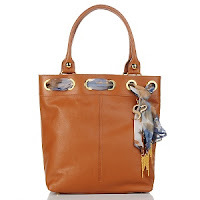 Serena designs clothes, jewelry and my weakness....handbags. Help me Lord. I'm drooling at the scarf tote to the right. Ya'll know I'm feeling that blue and gold scarf weaved through the top. Williams prices are reasonable. If you can afford a bag from JC Penny or Macy's then support Serena. Sistas, we spend so much money outside of our community. When the chance arises support your own. Thanks for telling me about Vanessa' new album. I love her. You're very welcome. I love Vanessa too and I'm disappointed because I haven't seen much promotion for her album. Thanks for the heads-up on these sistas. I will go out and buy Vanessa's CD. She has a beautiful voice and should have won a Grammy by now.